Sam is a Sigma 38 which will be familiar to many. They are fantastic boats - good for training, comfortable enough for cruising, good for racing and very importantly, they are very good sea-boats. Around 120 were built between 1987 and 1992, and most are still active. 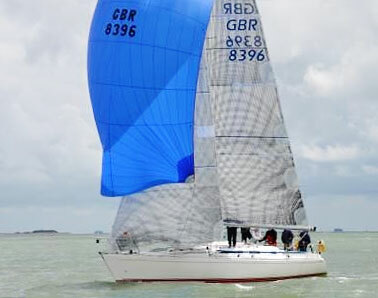 The class still has its own start in Cowes Week and last year it was the most numerous One-design in the Fastnet Race. Many have sailed the Atlantic, and at least one has sailed round the World. We bought Mustigo11 last December and she went in to Desty's shed at Hamble Point at the beginning of February to re-emerge in mid March as Sam of Hamble. 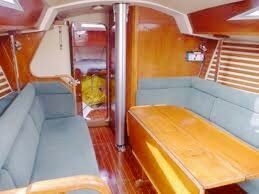 Over the 6 week she was there, the keel was removed and the bolts, having done 23 years service, were replaced. 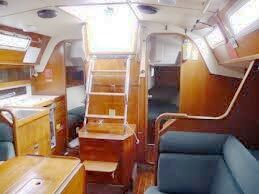 New windows, rudder bearings and lots more including new upholstery, floorboards, batteries etc etc. 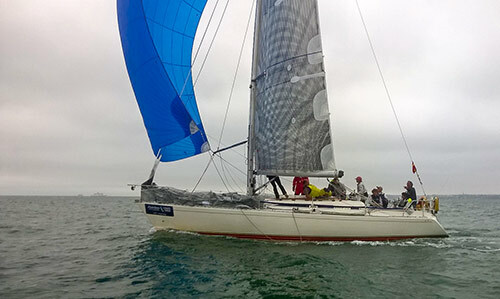 With Sam, we are continuing our theme of some adventurous sailing, some good and exciting races, some training, courses etc, and some cruising, which is a mixture of laid back trips with plenty of time ashore along with some more challenging trips. 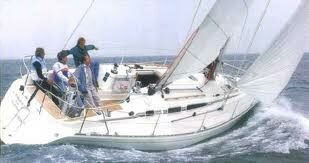 After several years, lots of fun and adventures our previous boat "Nisida" has gone to a new home, and we have gone back to a Sigma 38.